Breading cats hype, like or dislike it? 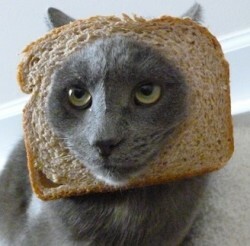 A new hype has recently gained much attention on the interwebs: Breading Cats (not to be confused with Breeding cats). “Breading cats”, also called Cat Breading or Breaded Cats, is a trend in which an owner makes a hole in a slice of bread and then puts it on a cat’s head. The picture does the talking and these pictures are spreading across social media like wildfire. Although the pictures are often entertaining, it is questionable if the cats are pleased with this human hype. In most pictures, the cats looks stressed or unhappy. This can be read from the cat’s expressions in eyes, whiskers and hairs. Two websites which are used as a base to share these pictures are www.breadedcats.com and www.breadingcats.com. I wonder how life would look like of the roles were reversed, would we be posted on facebook by our cats with dead mice pushed down our ears, or with our heads in a litter box… Maybe in an alternate universe some felines are having a laugh at our expense. 2 comments to Breading cats hype, like or dislike it? Personally i don’t like breading cats. I love funny cat pictures but breading is not something that cats love, so why put your beloved pet through that stress? I can’t even imagine why anyone would want to put a cat’s head through a hole in a piece of bread, much less why an entire website would be devoted to posting pictures of it. I can only imagine it was dreamed up by someone with a cat who was high at the time and happened to have both cat and bread. Dumb.